Today is the last day of the NAG2016 chess championship. Waiting Anis and Fahim playing against their respective opponents in the tournament hall, GiLoCatur enters the UTP's library located opposite the hall to write in this blog. Entering the final two rounds is very crucial to all the participating players especially on the top boards. Winning these two rounds will provide better ranking and give better chance for being on the podium in the prize giving ceremony. The results for Boys U6, Boys U8, Girls U6 and Girls U8 categories have been out. Let's look at them. The total of five players take part in each Under 6 age group category. Thus, it is a round robin for this group category. In the Boys section, Megat Musa is the leader. He has won all his matches thus far. GiLoCatur believes Megat Musa shall emerge as the champion since he is leading 1.5 point with one more round to play. In the Girls section, two players have same 3/4 points. They are Afiqah Zahra and Aghalya Tiaana. The former is leading for having better tie-break which is direct encounter. Forty players take part in the Boys section. Up to Round 7, no one has the full point. 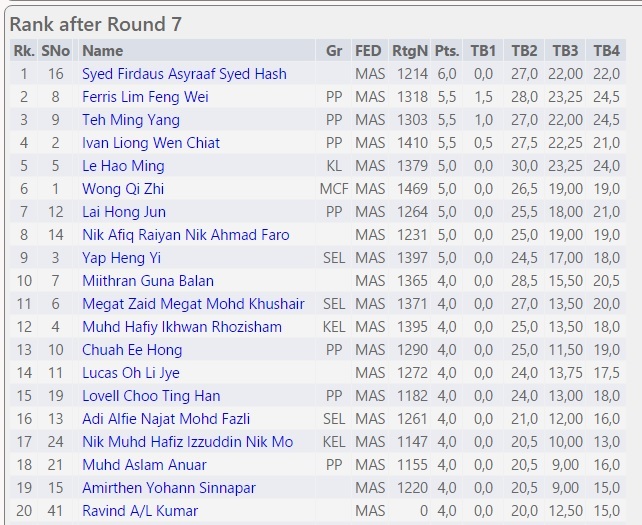 Leading the pack after Round 7 is the 16th seed, Syed Firdaus Asyraaf. Trailing half-point are three players from Penang. Can Syed Firdaus win his final game and emerge as the champion? Or can Ferris Lim stop Syed Fidaus from winning the championship? What a final round game for both of them. As typical it is the boys age group outnumber the girls age group, only eleven participants in the Girls section for U8 age group category. 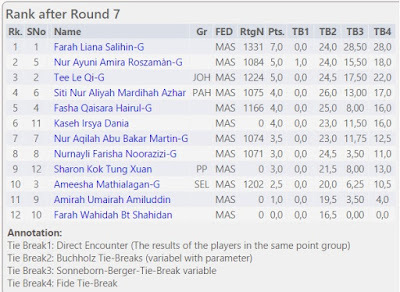 Farah Liana won all her games accumulating full point ie 7/7. She is leading by two points. 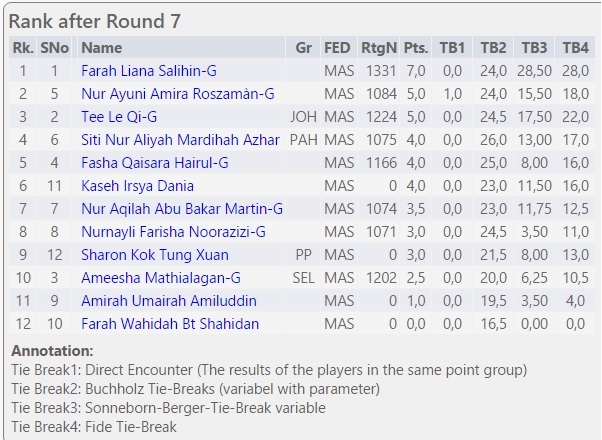 Entering her final round, Farah Liana has a huge advantage to win the Girls Under 8 age group title. This morning around quarter to 8:00 AM, my family and I started our journey from home in Shah Alam to University Teknologi Petronas or its acronym UTP. 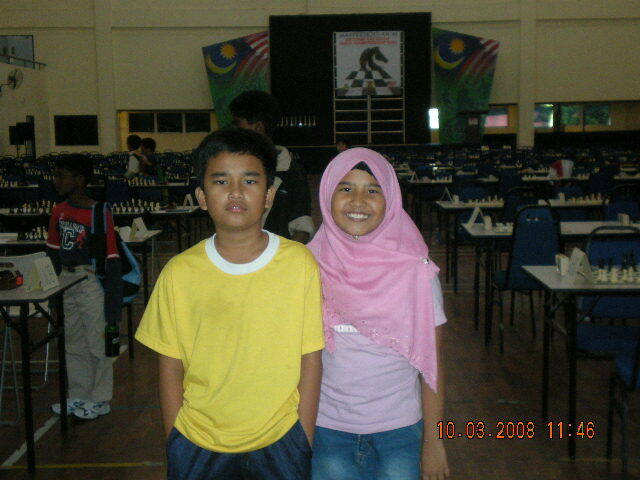 The reason of going to UTP is two of my children - Anis and Fahim, are taking part in the National Age Group (NAG) chess championship. The first round kicked of at 10:10 AM, ten minutes late that schedule. Due to many vehicles on the PLUS highway, we were a bit late to arrive at UTP. Luckily, we arrived before the 30-minute dateline for a forfeit game. How many times each of my children have taken part in the NAG? Mmmmm sorry, GiLoCatur cannot answer straight away. Which edition was the first time GiLoCatur's children took part? This question GiLoCatur can answer after checking on the photo album archive. GiLoCatur would also check the archive of this blog to recall the NAG editions that the three of GiLoCatur's children - Fikri, Anis & Fahim, have participated. This is one of the reasons why GiLoCatur create and write this blog. 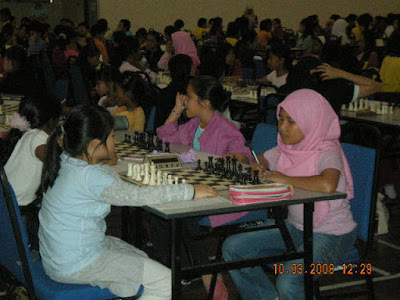 In 2008 NAG edition, only Fikri and Anis were taking part. Aged 12-years old, Fikri was playing in Boys Under 12 age category with national ratings of 1460. He was seeded 8th out of 57 players. Meanwhile, Anis was playing in Girls Under 10 age category. She was nine 10 years old and was seeded 21st out of total 26 players with national ratings of 887. How both fared in the NAG chess championship? Both were not among the winners. In the NAG, the winners are only the Top 10. 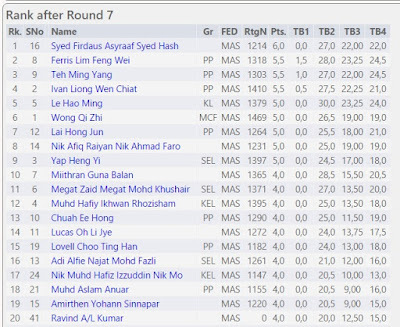 With 5/8 points, Fikri was ranked 17th. Several players have become Fikri's team mates in later years. Two of them were Fikri's team mates in 2011 MSSM chess championship. 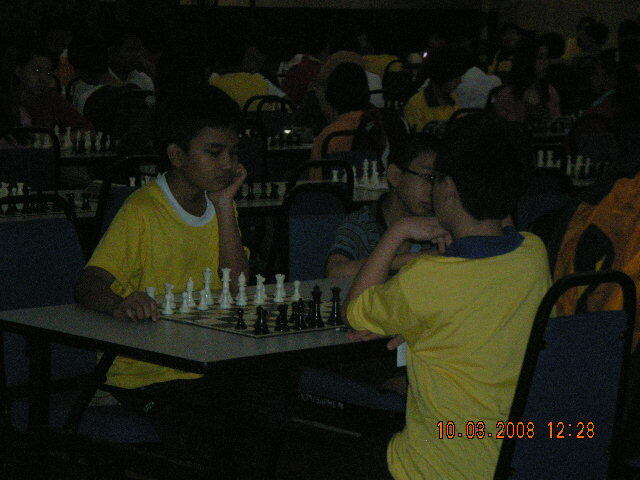 Three others were Fikri's team mates in 2013 MSSM chess championship. One other is Fikri's team mate in KARISMA last year. While Anis was placed 16th. She scored 3.5/8 points. Two of the winners in Girls Under 10 age group category are the Top 3 seeded players this year. This year edition of NAG will be the last participation for Anis. Who were the champions for each age group category in NAG 2008 edition? Surprisingly, GiLoCatur does not have the results for U14 age group categories.